Copyright lawyers must be the dumbest people on earth. I mean, how else could you explain this? 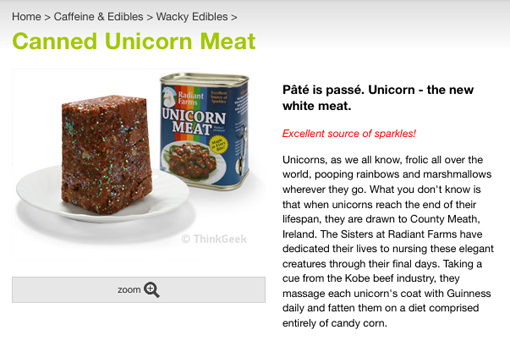 The website ThinkGeek, which sells a host of great products for those with a goofy sense of humor, also sells a canned SPAM-like product called unicorn meat. It’s billed as an excellent source of sparkles. They say, in their website sales page, “Pate is passe. Unicorn–The New White Meat.” Well, apparently the National Pork Board owns the phrase “white meat,” because they’ve sent ThinkGeek a cease and desist letter over unicorn meat. Now, ThinkGeek is having a little fun with the lawsuit, by making PORKBOARD a coupon code for $10 off any order of $40 or more, so head on over there and support the company by picking up a can of Twilight-sparkly spam or some funny tee-shirts or something. These guys deserve it; they can take a joke, unlike a certain board made out of meat products that I won’t name.